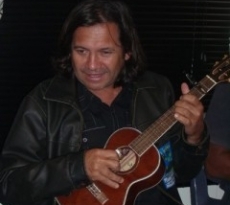 Stephen Pigram is a singer and musician who plays acoustic guitar, harmonica, requinto, vahlia, ukulele and dulcimer. He is one seventh of the country folk/rock band The Pigram Brothers, whose album Saltwater Country was voted Best Debut Album at the National Indigenous Music Awards in Sydney in 1998. Stephen has been a member of legendary Broome bands Kuckles and Scrap Metal and he was musical director for the original production of the first Aboriginal musical, Bran Nue Dae.